Just returned from Tahiti and have exciting information to share. Please check back as I am updating this page on a regular basis. We visited Tahiti, Moorea and sailed on the fabulous Paul Gauguin!! 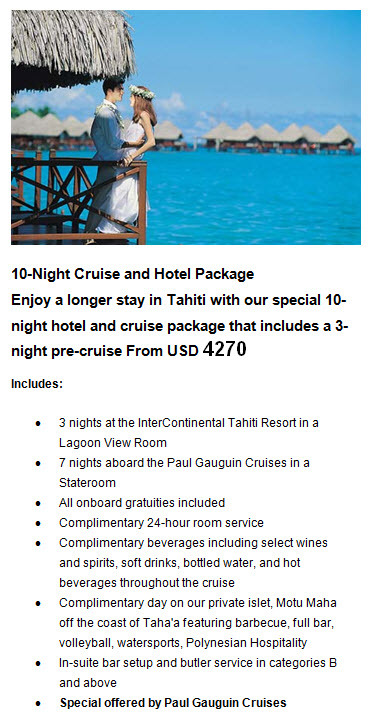 I look forward to sharing all that Tahiti has to offier!! Many islands are crowned with jagged peaks while others appear to barely float above the breaking waves. Spanning an area in the South Pacific as large as Western Europe, the total land mass of all the islands adds up to an area only slightly larger than the tiny state of Rhode Island. Easier to travel to than you might imagine, Tahiti's Faa'a International Airport is under 8 hours by air from Los Angeles (LAX) airport, with daily nonstop flights. As far south of the equator as Hawaii is north, Tahiti is halfway between California and Australia, on the same side of the International Date Line. Le Méridien Bora Bora is a Polynesian paradise offering extraordinary views of the island and overlooking Mount Otemanu as well as the Bora Bora lagoon. Situated on one of the finest beaches in the South Pacific, the resort is an ideal retreat for anyone seeking exclusive and ultimate privacy. There are no roads and no traffic – just peace, tranquility, and eye-catching tropical beauty. Le Méridien Bora Bora also offers the Turtle Sanctuary, a unique opportunity to meet, greet, and learn about marine turtles in their natural environment. You will observe their behavior and learn how they are cared for. We actively participate in the protection of sea turtles, including green turtles. A special program has been implemented to ensure a lively and successful future for the turtles in the ocean. In co-ordination with Bora Bora’s Ministry and the Delegation of the Environment, a team is devoted to the care of the marine turtle at the resort. This care center, located in the heart of the resort, is unique in French Polynesia. As James Michener described, "Once you set foot, you always long to return." The m/s Paul Gauguin was designed specifically to sail the shallow seas of Tahiti, French Polynesia, and Southeast Asia visiting small ports that larger ships can't reach and effortlessly blending into the stunning natural beauty of the South Seas. She offers an extension of the informal, relaxing environment of the islands, coupled with five-star service, comfort, and luxury. Spacious suites and staterooms (more than 70% with private balconies), an onboard watersports marina, a choice of three open-seating dining venues, and an extensive spa are among her luxurious attributes. The atmosphere aboard the ship radiates warmth, informality, and Polynesian flair. And our beloved troupe of Gauguines—local Tahitians who serve as cruise staff, entertainers, and storytellers—add the unique personality of Tahiti to every cruise.